We live in a sensitive society where major controversies seem to be hitting the headlines on a regular basis. But just because something is controversial doesn’t necessarily mean it’s bad. On the contrary; sometimes a little controversy can produce positive results. When it comes to marketing, sometimes you need to play things close to the edge if you want your campaign to stand out in this very crowded digital world. If a campaign idea makes you uncomfortable, you should probably run with it. It might sound like a risky policy, but the fear of causing a stir is the primary reason why many marketing campaigns end up so bland and ineffective. Nobody ever became famous by being ordinary. Nobody ever had their name etched into history by blending into the crowd. If you want to be seen and remembered, you need to grab your audience’s attention. Unfortunately, that rarely involves being liked by everybody. Of course, you shouldn’t simply run with the first crazy idea that pops into your head. A certain amount of rational thought is still required. Don’t go trying to be controversial just for the sake of it. If you’re going to run with an edgy campaign, it needs to have some substance to it. Nike’s recent ‘Believe in Something’ campaign featuring NFL pro Colin Kaepernick is the perfect example of this formula. 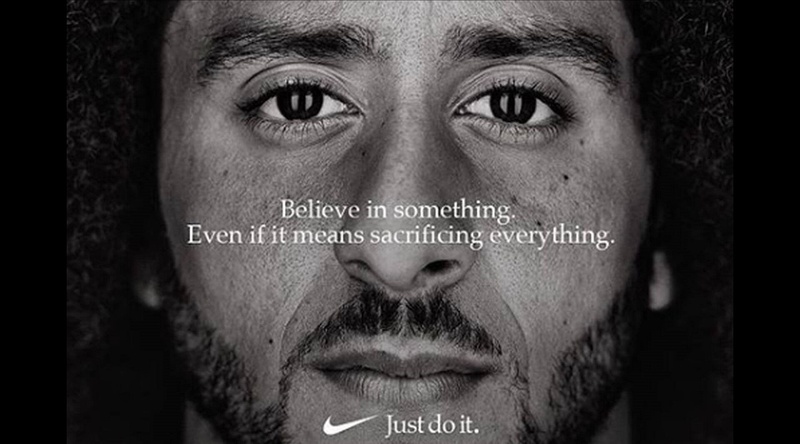 The campaign caused a huge uproar when it was launched in September 2018, due to Kaepernick recently protesting for the ‘Black Lives Matter’ movement by kneeling during the US National Anthem. Despite strong criticism from those who opposed Kaepernick’s actions, the campaign resulted in Nike’s stock rising to an all-time high. So, what made this move such a huge marketing success for Nike despite the backlash? Simple: they stood up for something. More specifically, they backed a prominent figure who stood up for equality – a value that the majority of today’s youth are almost guaranteed to support. Just like you shouldn’t seek out controversy without a good cause, you shouldn’t try to back a cause unless it’s something you and your brand can genuinely support. If your audience suspects that your campaign is phoney in any way, the backlash could cause catastrophe. Case and point: Pepsi’s ‘Live For Now’ campaign. This campaign, featuring model Kendall Jenner, received overwhelming criticism immediately after its launch as it appeared to trivialise the ‘Black Lives Matter’ movement (the same movement seemingly supported by Nike with their aforementioned campaign). Such was the strength of the backlash that Pepsi opted to pull the ad and issued an official apology. So, why did Pepsi’s campaign fail where Nike’s has succeeded? Once again, the answer is simple: One appeared authentic; the other did not. If risking a little controversy isn’t something that suits your brand image then don’t worry, there are many other ways you can create brand awareness and achieve marketing success. A creative, open-minded approach is probably the most important element of constructing a solid marketing campaign – whether you plan on rocking the societal boat or not.